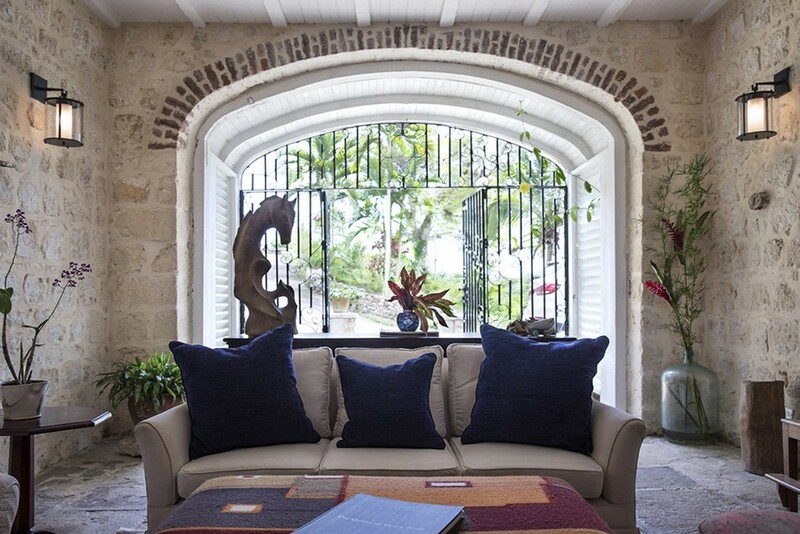 Welcome to Coach House at Good Hope, a luxury 7 bedroom private villa in Jamaica. 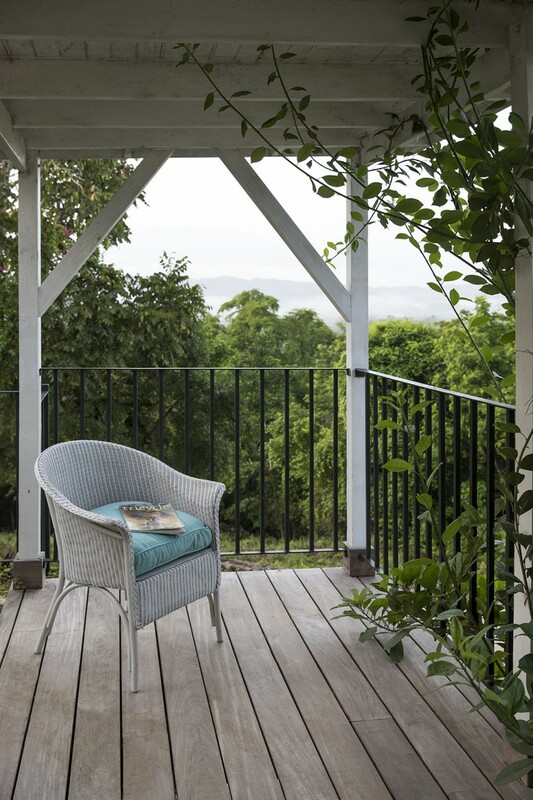 Nestled amongst two thousand acres of the tall luscious trees and rich tropical plantation, amidst the rolling misty Cockpit hills of Good Hope Estate, resides the beautiful Coach House Villa. 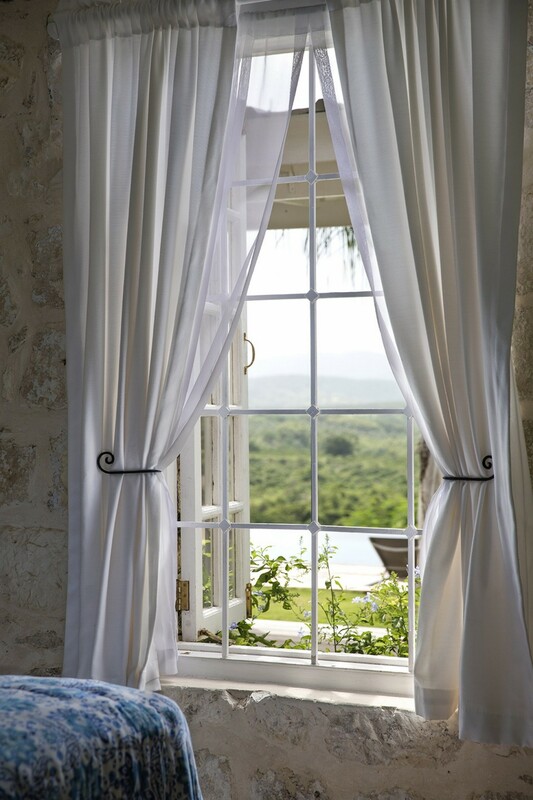 This stunning 7 bedroom period property is located in the heart of the 18th century Good Hope Plantation boasting an unrivalled haven of privacy, beauty and nature to be enjoyed and appreciated by the entire family. 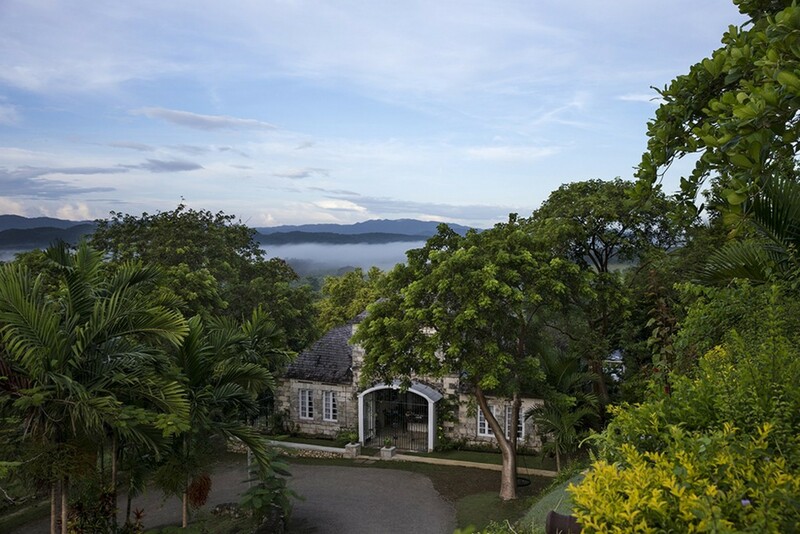 It has a truly unique location steeped in history and offers the perfect retreat for a family reunion or group of friends to spend time relaxing and enjoying the breathtaking surroundings that the estate has to offer high up in the hills away from the all the noise and distraction down below. 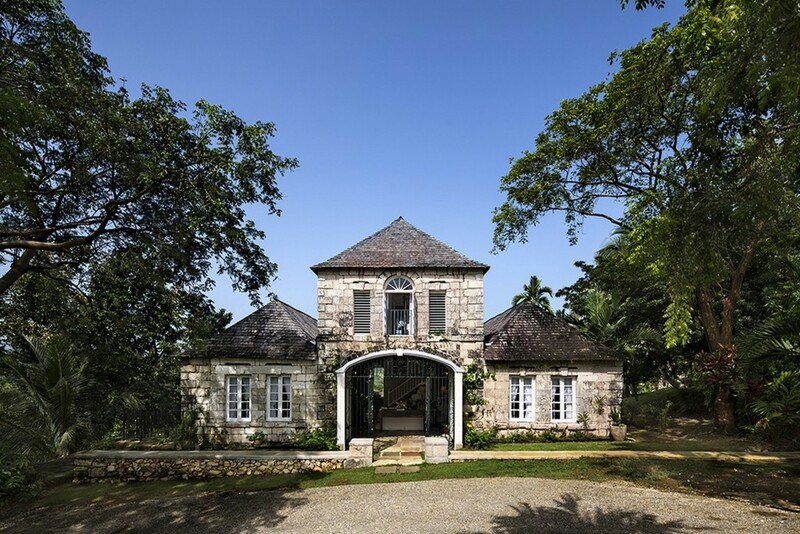 Amongst the tranquil hills and lush plantation of the estate, nestled at the end of a tree lined, private gated drive stands this exquisite cut stone country villa brimming with a sense of understated elegance and charm. The façade of the property is framed by towering trees and manicured lawns and oozes character and a timeless beauty. 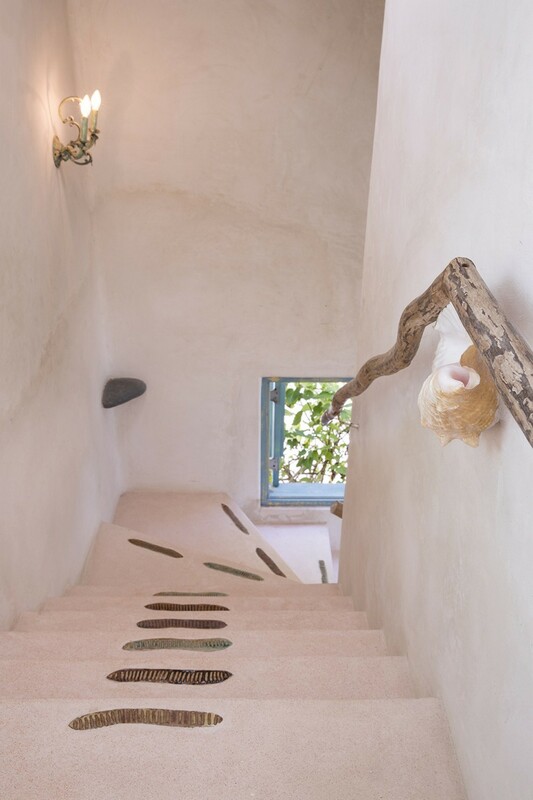 Age-old stone steps lead you through the curved entrance way and into the elegant, light filled interior. 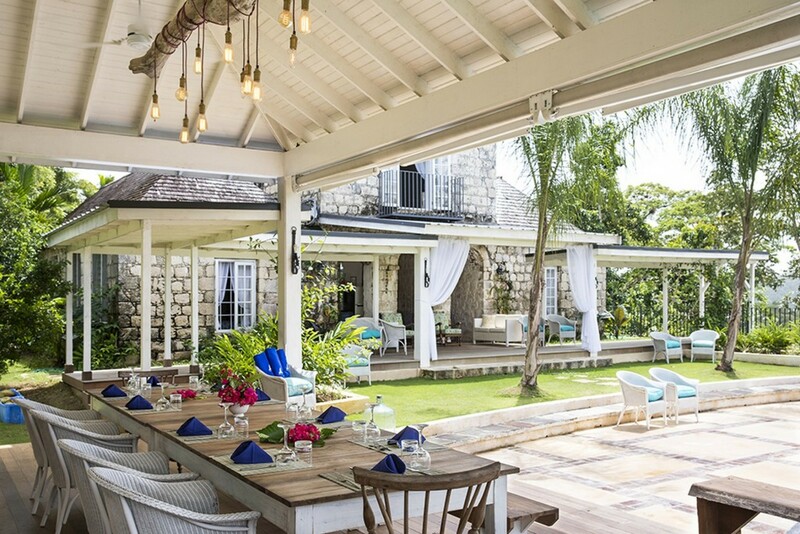 The Good Hope Estate and plantation itself was built during the 18th century, and since then the property has been recently refurbished and redecorated to an impeccable standard, and creates a unique blend of historic charm and effortless luxury. 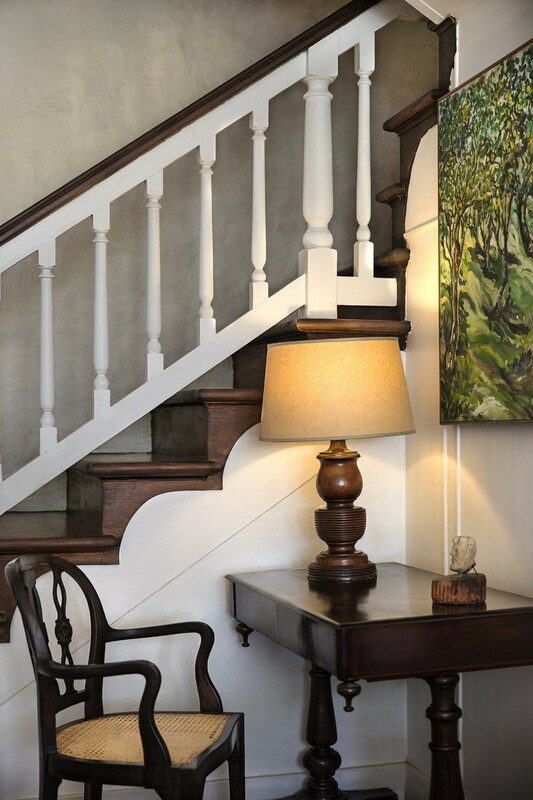 Each piece of antique furniture and artwork beautifully accentuate the exposed stone walls and restored period features. On the ground floor you will discover four of the seven spacious and tastefully decorated bedrooms all of which have ceiling fans, air conditioning and en suites. 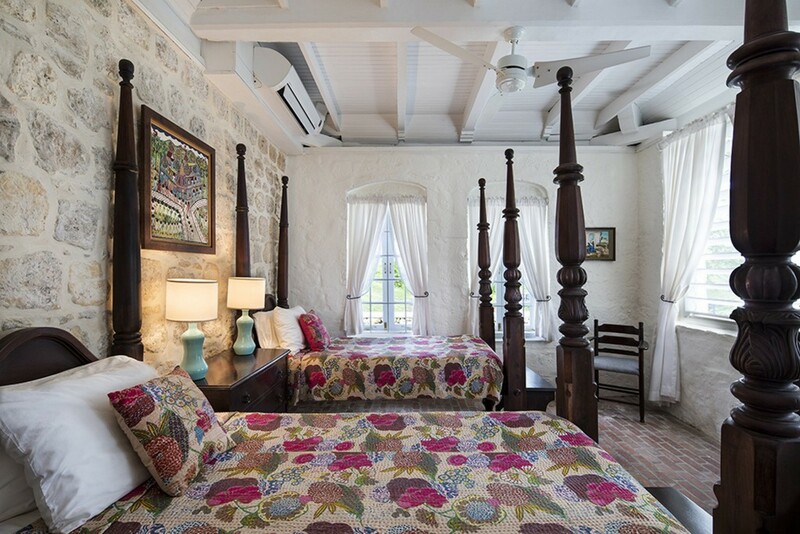 Three of the bedrooms exhibit two charming four poster twin beds in keeping with the colonial style of the Coach House. 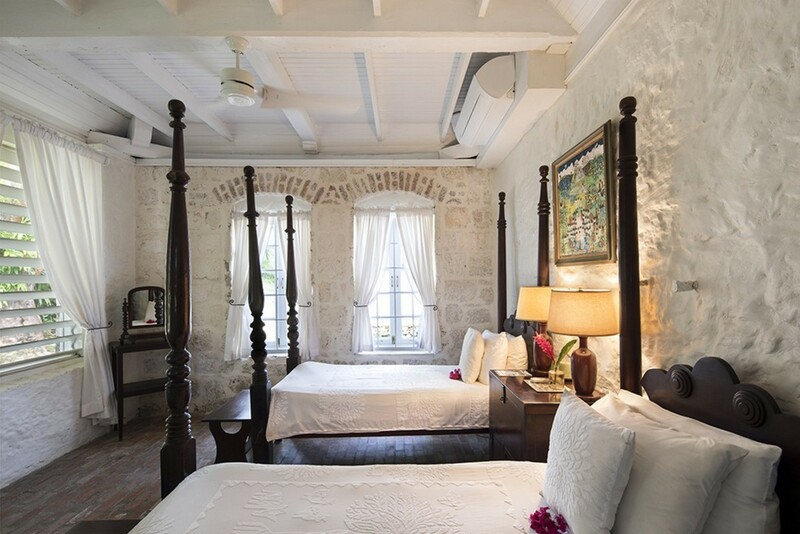 As you enter each of the bedrooms yours eyes will be drawn to the beautiful white washed walls adorned with exposed stone and beautiful wood beamed ceilings. 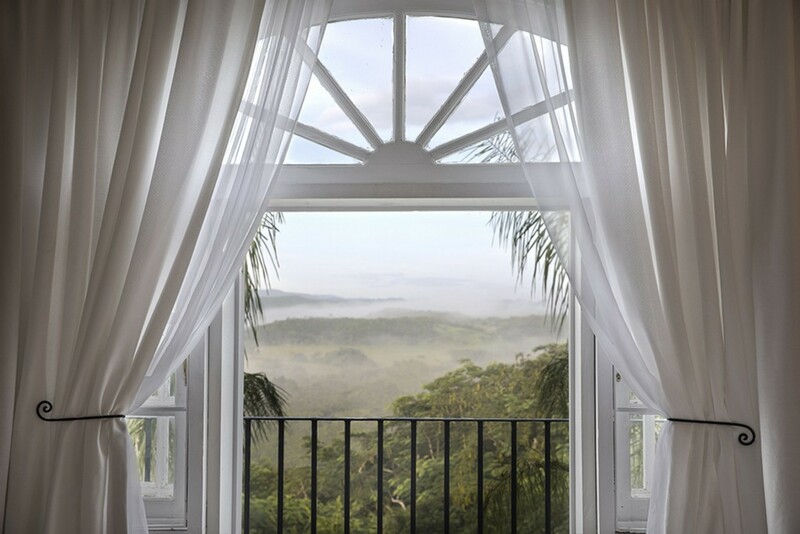 The master suite is situated on the first floor and boasts breathtaking views over the mesmerizing, mist covered hills of the spectacular plantation sweeping down towards the horizon. 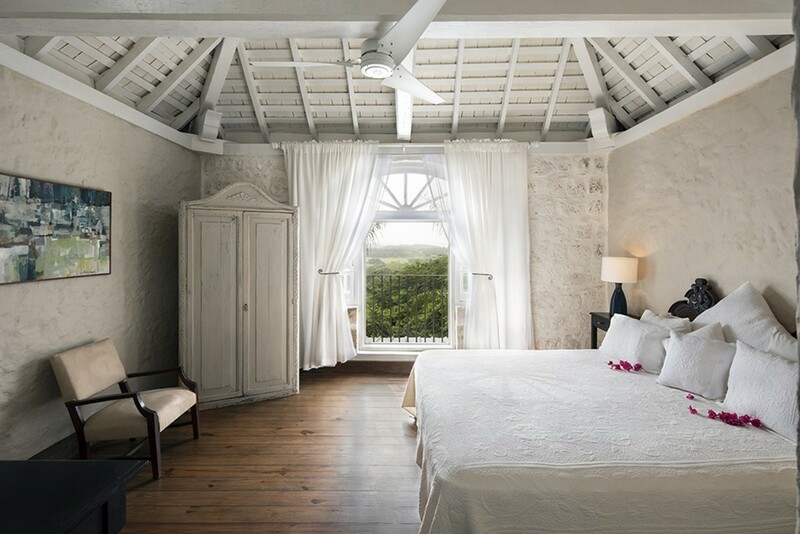 Each bedroom has been carefully decorated in theme with the villa’s luxurious yet comfortable style, creating a secluded haven for relaxation after a long day exploring all that the estate has to offer. 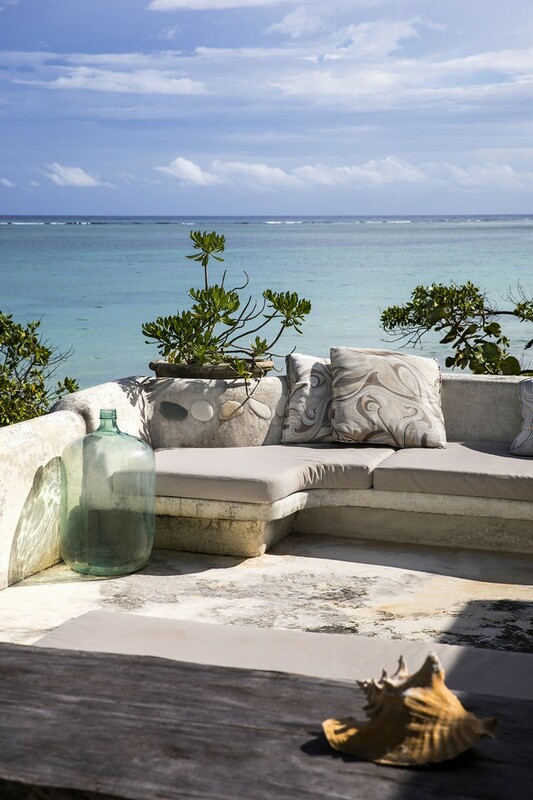 The villa also provides ample outdoor space for guests to enjoy and discover. 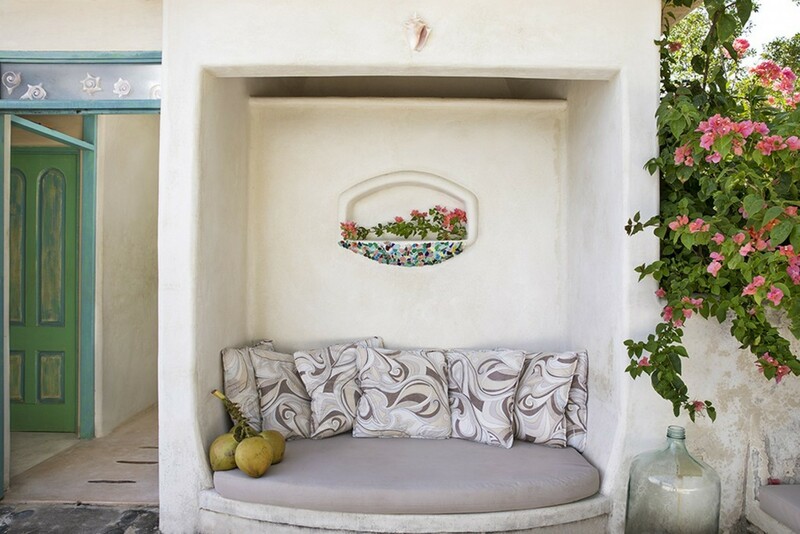 A myriad of tranquil seating areas can be found throughout the property, ideal sanctuaries to sit and read a novel or enjoy a glass of wine and the mesmerizing scenery. 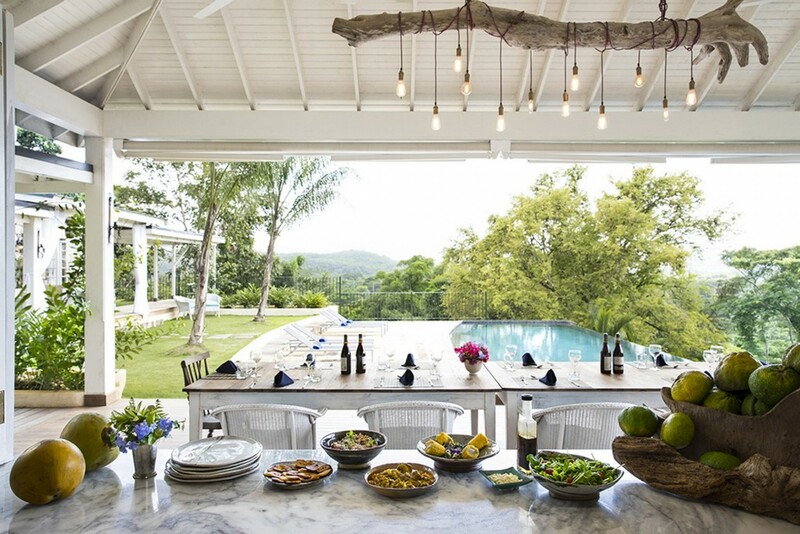 The main veranda encompassing a dining table and kitchen lends itself perfectly to alfresco dining at any time of day whether it be a family lunch before you set off on an adventure or a romantic candle lit dinner. 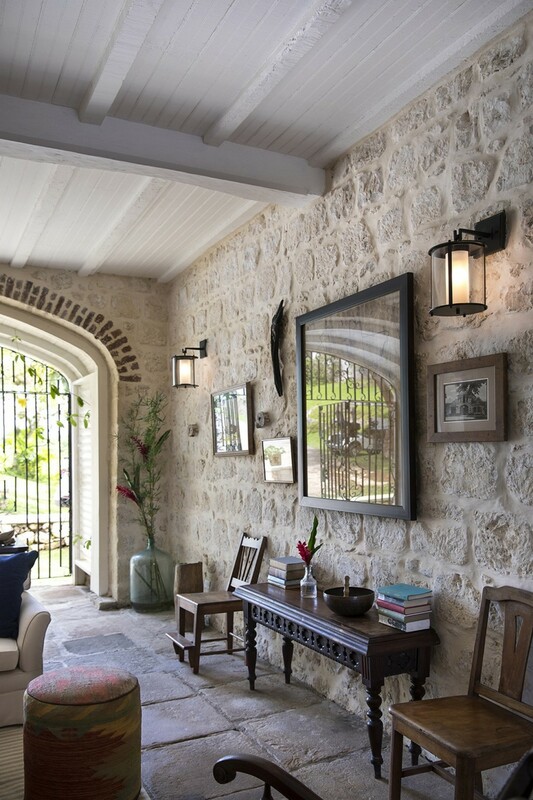 There is a wonderful sense of indoor outdoor living so as guests can still appreciate the warm Caribbean breeze while cooling off in the shade. 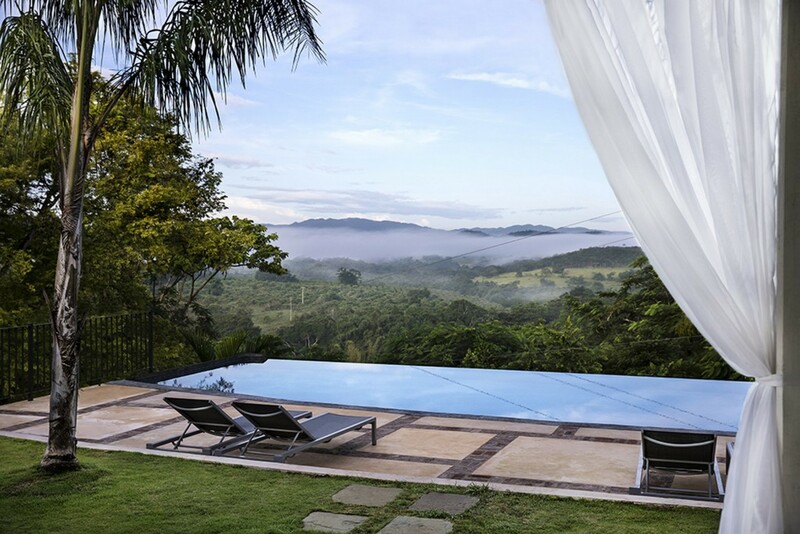 Several stone slabs placed on the lush green lawn lead you to the exquisite infinity pool which is perched over the enchanting, rolling hills of the plantation and valley below. 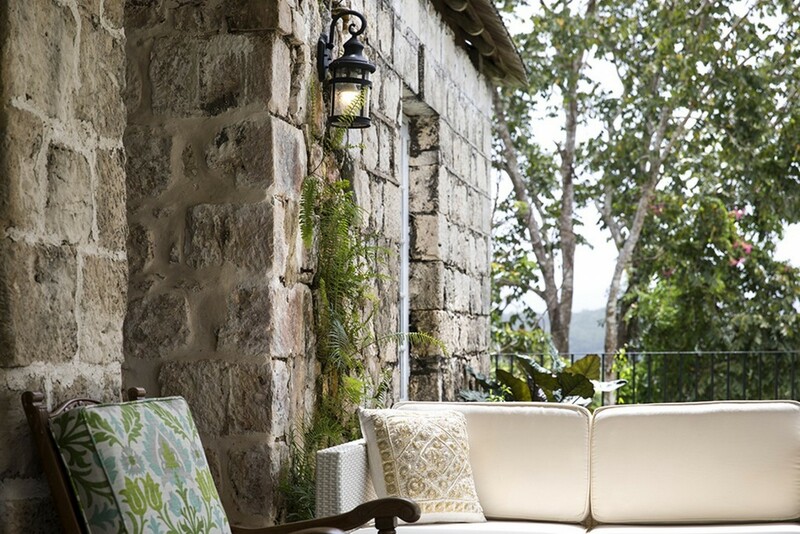 This is the perfect place to relax and unwind reveling in the nature and immense beauty of the historical estate. Although during the day there is never a need for entertainment, when the sun sets over the picturesque view guests can move their attention to the outdoor movie projector and entertain themselves with one of their favourite films under a star covered sky. The glorious, pristine white sands of Gold Hope private beach is just a 15 minute drive from the villa. This 110 foot stretch of beach is an unparalleled location to spend a day with family and friends. The has an excellent array of non-motorized water sports which are complimentary to all guests and ensure you will enjoy a day filled with laughter and fun. Whether you may want to try paddle boarding, kayaking or snorkeling discovering the beautiful and unique sea life of Jamaica. 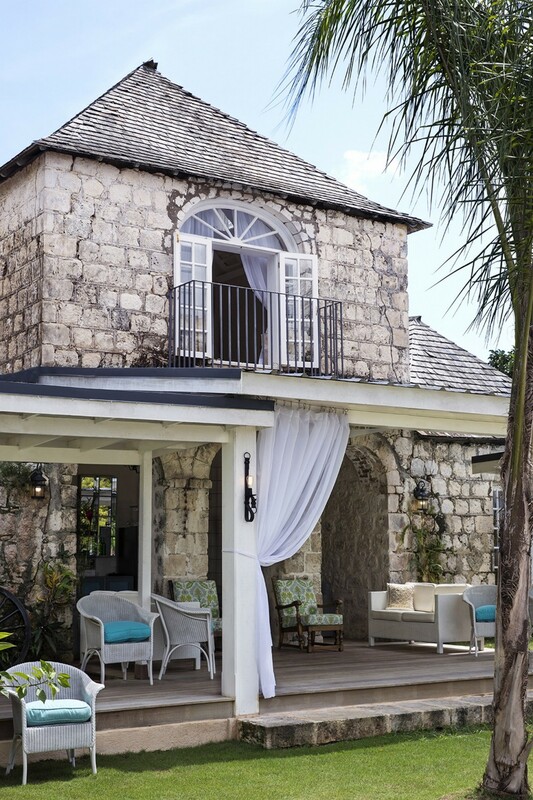 If you are in search of a more peaceful day admiring the clearest turquoise waters Jamaica has to offer, loungers are located by the water’s edge where guests can soak up the Caribbean sun as they listen to their choice of music on the installed surround sound system. 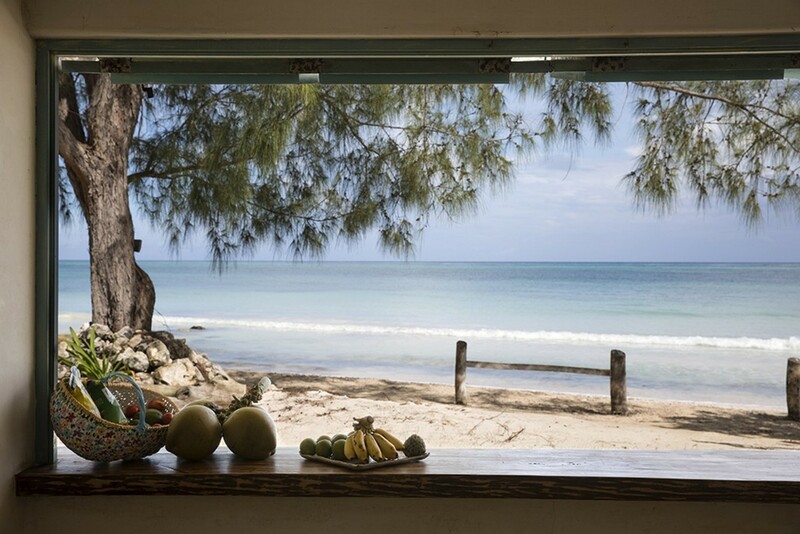 There is no worry of getting hungry as you explore the splendid shores of the beach. The remarkable staff of the Coach House will deliver a delicious picnic for all the guests. 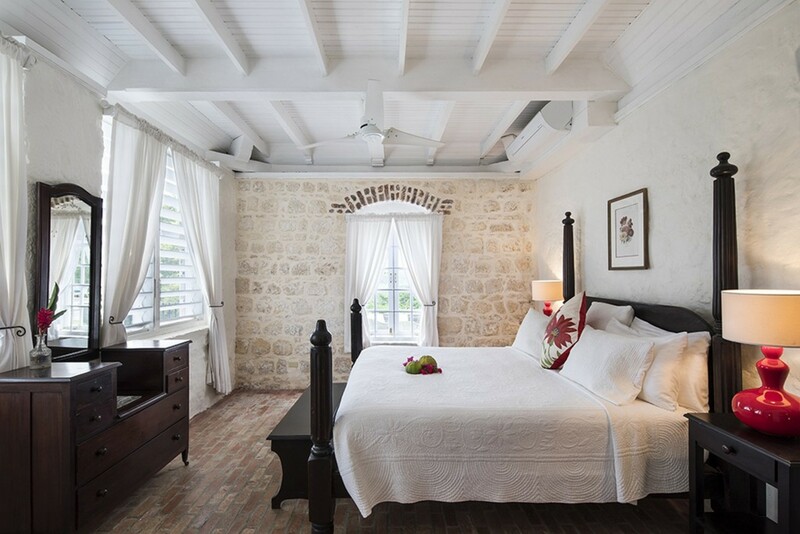 This can be enjoyed on the beach or on the spectacular private sun terrace of the romantic beach lodge exhibiting panoramic views of the tranquil Caribbean Sea. 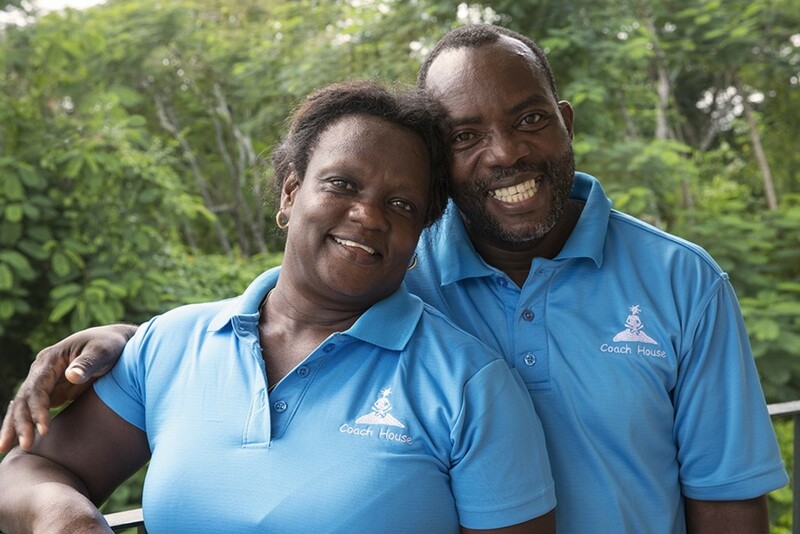 It cannot be denied that one of the villa’s most distinctive attributes has to be is its incomparable and exceptional team of staff who will do everything they can to ensure you have pleasant and comfortable stay. 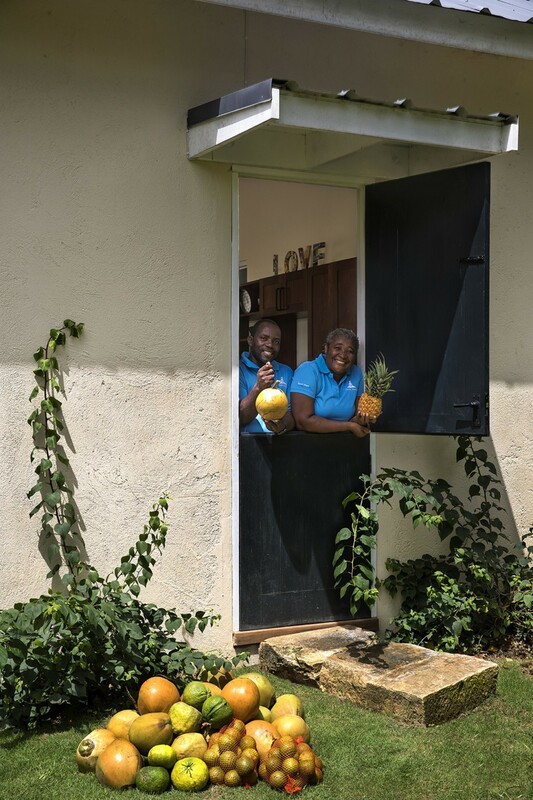 The staff at Coach House villa are welcoming always thrive to grant your every want and desire with a smile and an overwhelming sense of Jamaican hospitality. The team go above and beyond what is needed to ensure you is content and cared for throughout the duration of your stay. 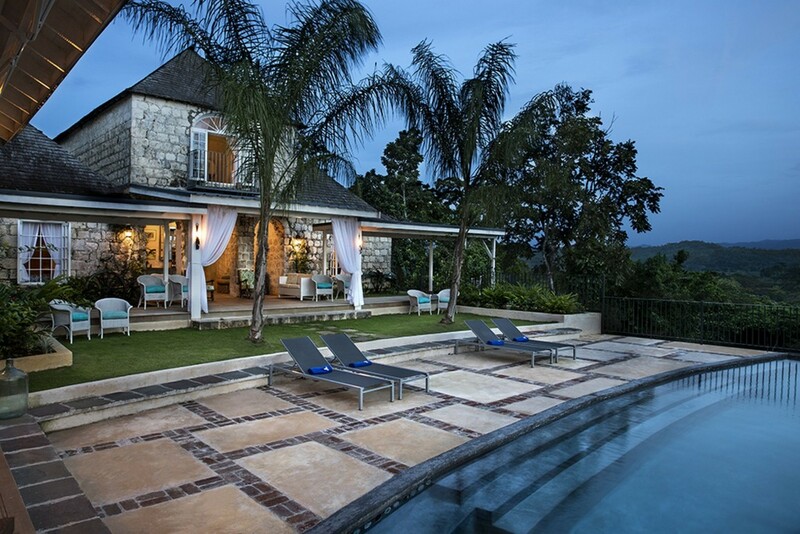 This stately property’s location positioned amongst the Cockpit hills is unrivalled and sets this exquisite villa apart from others on the island. 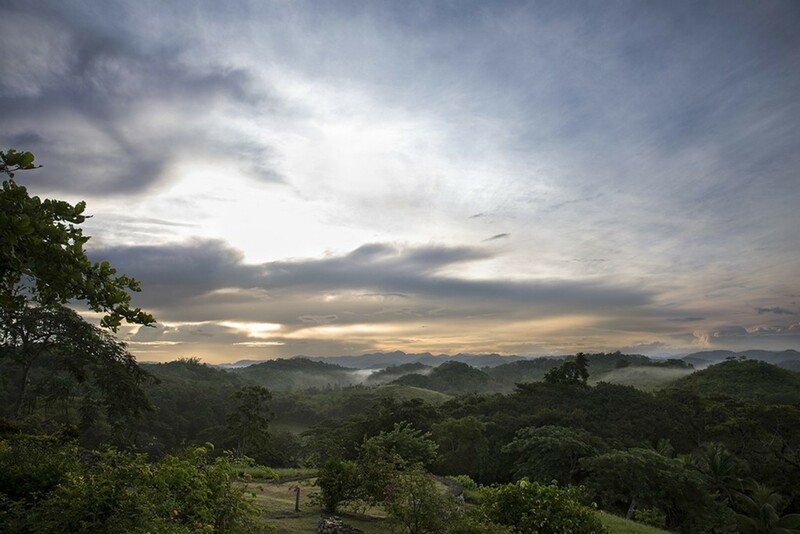 Surrounded by 2000 acres of lush plantation land and rolling hills, the scenery is truly dreamlike, a tranquil oasis in the skies. 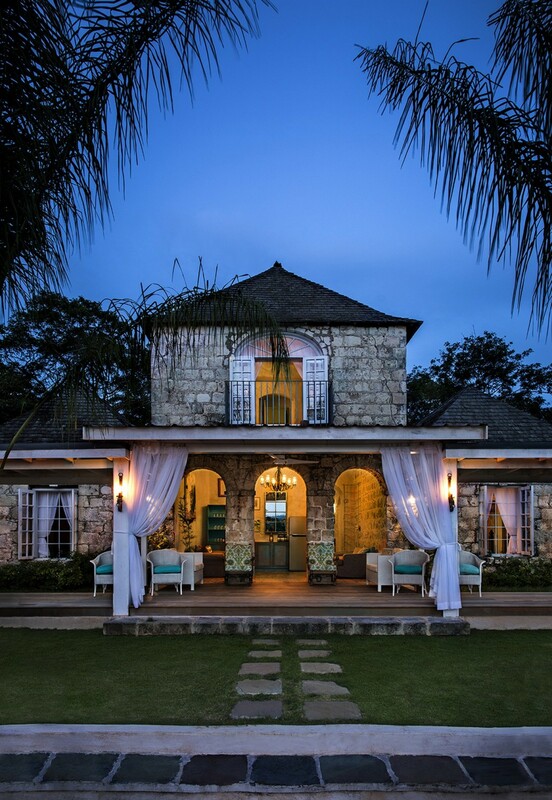 The Good Hope Estate is the Caribbean’s first and only nature and adventure park and offers guests an exceptional array of adventure and cultural experiences. 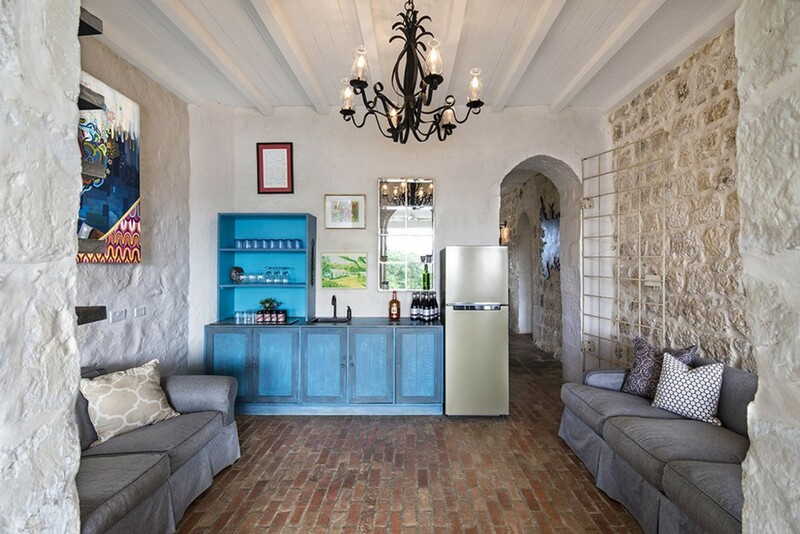 There is never a lack of entertainment for guests, if you have an interest in the history a visit to the Apleton Rum Tasting may quench your thirst for knowledge about the historic rum distilling industry. For those more adventurous guests, there is a zip line is a must which allows you to fly high above the tree tops. 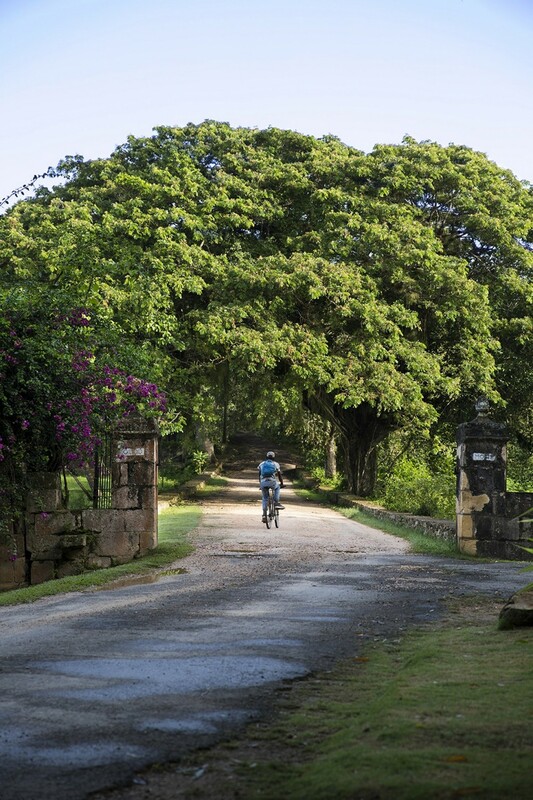 If you would like to continue exploring the beauty and history of the estate and of the island, Chukka Tours one of the best tour guide companies on the island operates from the estate, and will take you on extraordinary hikes through the dramatic and diverse scenery of the estate. 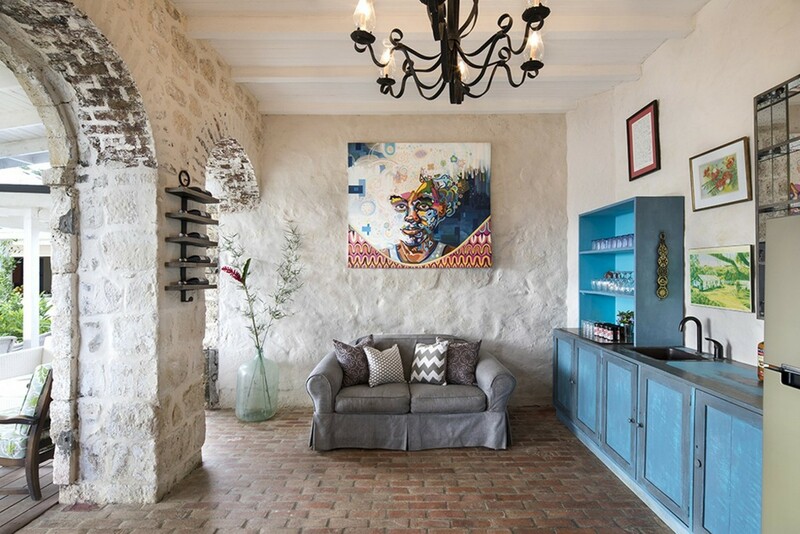 The Coach House villa of Good Hope Estate luxurious yet simple design and décor combined with its exquisite location offers an unrivalled source of adventure and exploration for some while still offering a sense of complete tranquility for those in search of a more relaxed vacation. 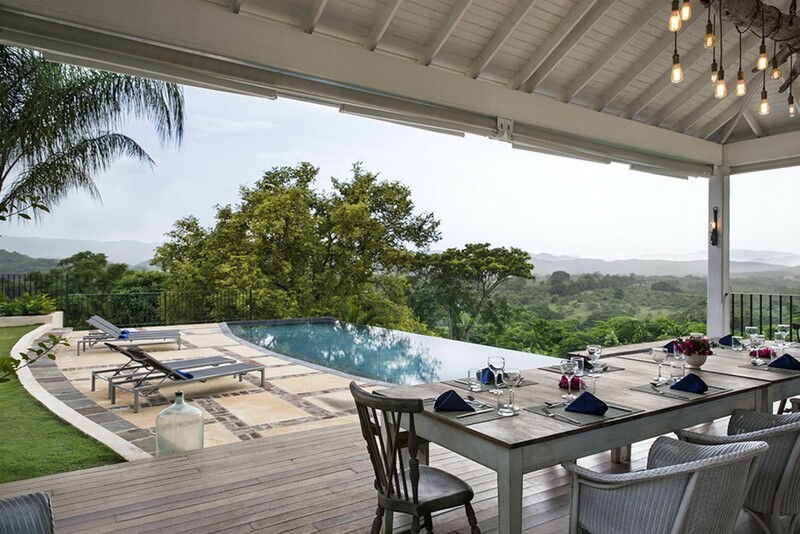 Perched amongst the tree tops of this sublime estate this charming and stately villa is an unparalleled villa and perfect place to make many memories of a lifetime. King-size bed (or option of 2 twin beds) and en-suite bathroom with walk-in rain shower, ceiling fan, air-conditioning. Located on the ground floor. 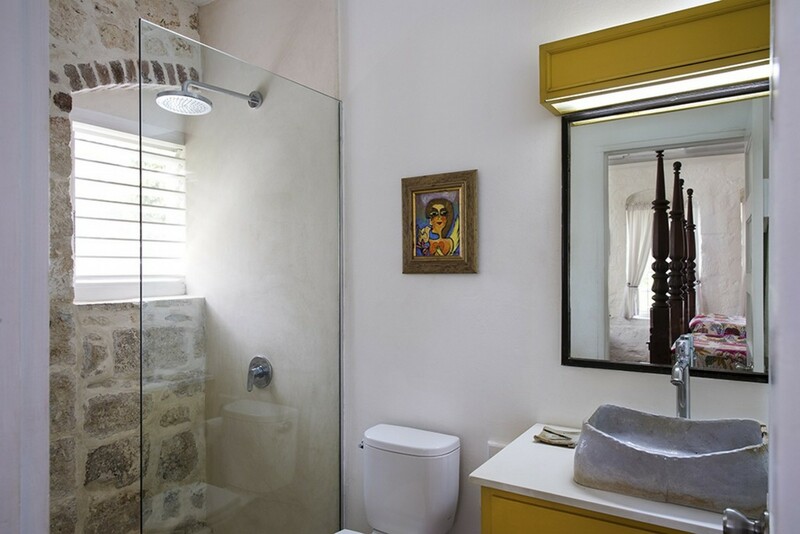 King-size bed and en-suite bathroom with walk-in rain shower, ceiling fan, air-conditioning. Located on the ground floor. 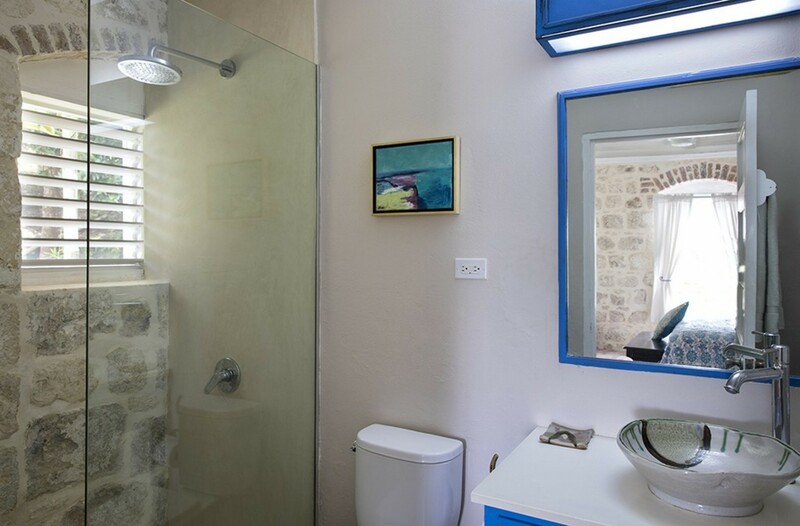 King-size bed (or option of 2 twin beds) and en-suite bathroom with walk-in rain shower, air-conditioning, ceiling fan, beautiful views over the pool. Located on the ground floor. 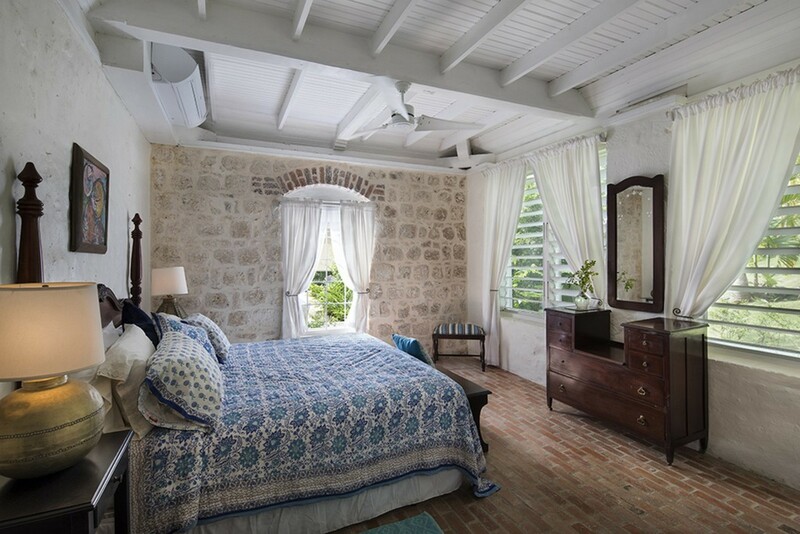 King-size bed and en-suite bathroom with walk-in rain shower, ceiling fan, views over the front of the house and manicured gardens. Located on the ground floor. King-size bed (or option of 2 twin beds) and en-suite bathroom with walk-in rain shower, ceiling fan, air-conditioning. Situated on the first floor. 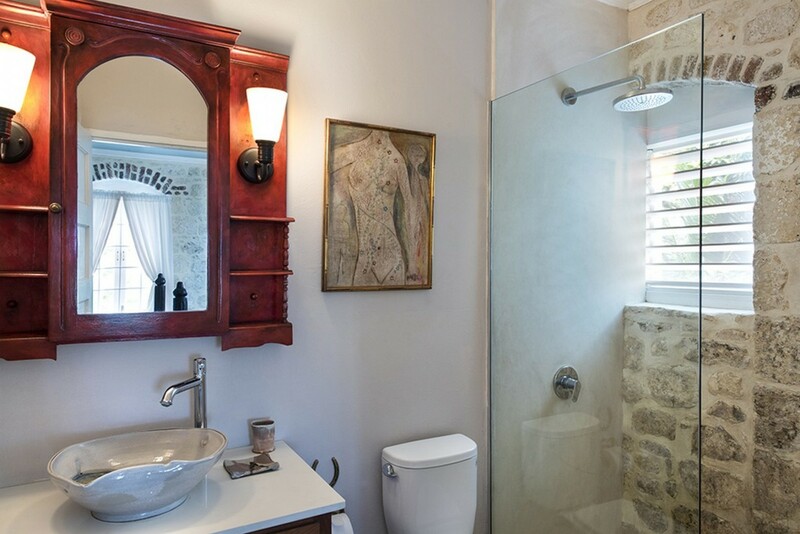 King-size bed and en-suite bathroom with walk-in rain shower, ceiling fans and air-conditioning with spectacular views of the valley. Situated on the first floor. 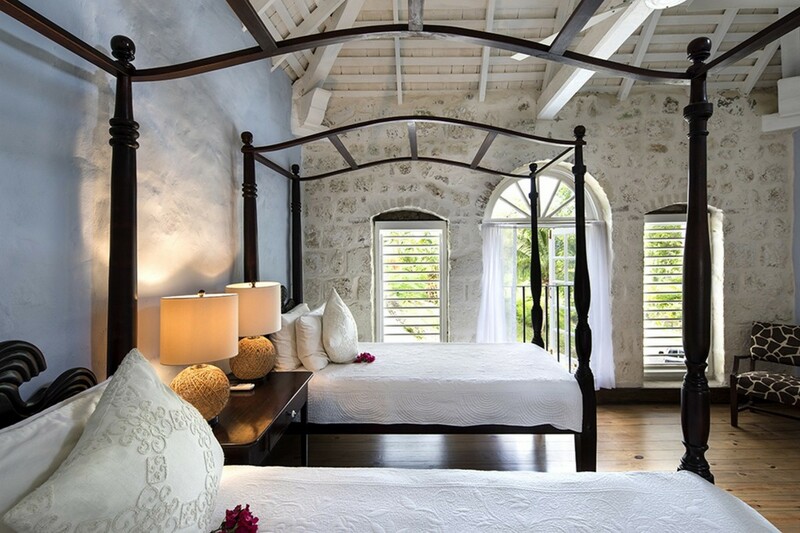 Private bedroom on the garden level. 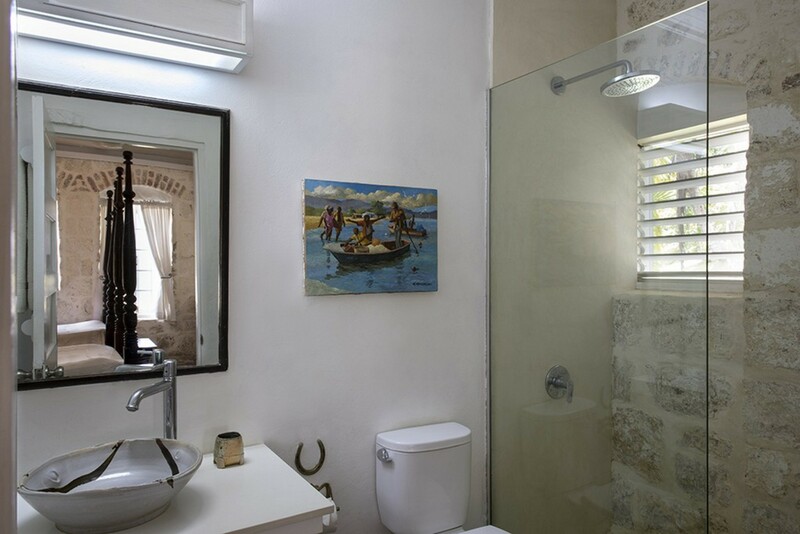 Queen-size bed and en-suite bathroom with walk-in rain shower with ceiling fans and air-conditioning. 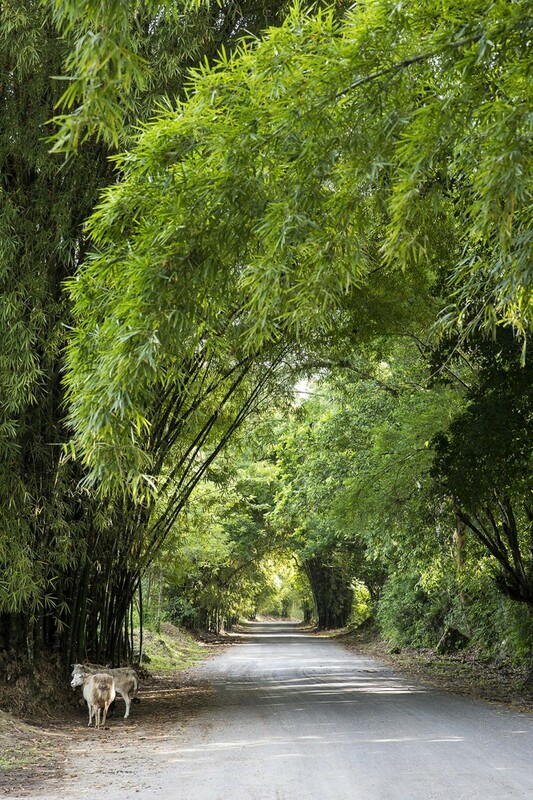 • Walking distance to Chukka Tours the best tours on the island. A week ago my husband and I hosted 14 of our friends at the Good Hope House. Now, I don't mean to brag, but we are well traveled, and have visited Jamaica before and this trip was by far our BEST experience! The grouds are breathtaking and the house is spectacular. The food was exquisite and Ms. Barb and her amazing son Garfield will fill you with world class cuisine cooked with ONELOVE, mon. During our trip we were offered an amazing group rate because of our stay that included zip lining, atv, and tubing. We enjoyed their private beach the world's biggest bonfire, and all the rum and red stripes a girl could want. And, the actual owners of this massive property, Blaze and Tammy are natives to the land, and will guide you along your process. My one critisisim is that I won't be able to keep this magical place to myself. Thank you to the entire staff, that has become family. Love & Light my Good hope Loves! 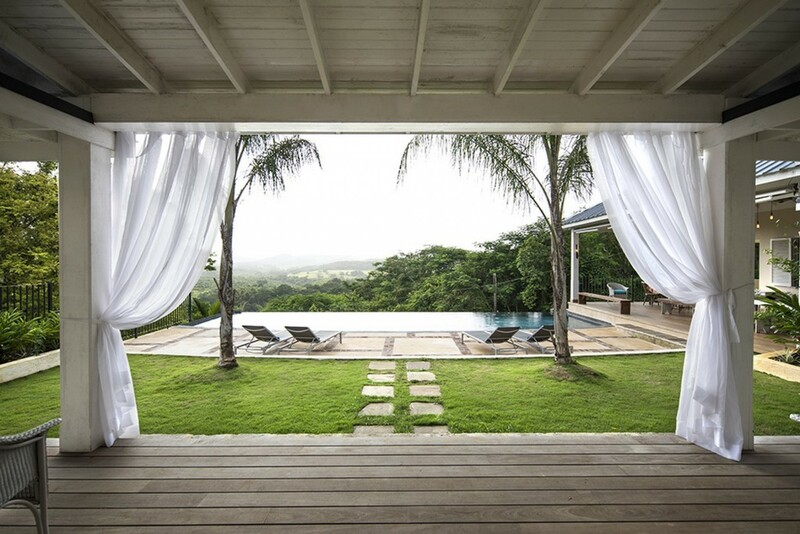 We travelled to the villa as a group of 11 and were blown away upon arrival! The view from the pool is just spectacular, the rooms are large and all have private bathrooms and the villa is decorated with a lot of taste. The staff was very kind and helpful and exceeded every possible wish! 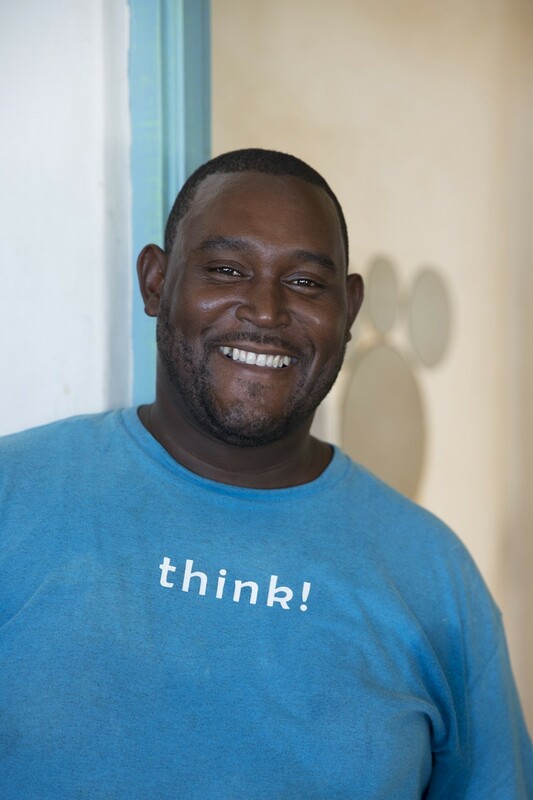 The food was great and we were able to taste the Jamaican local flavors. 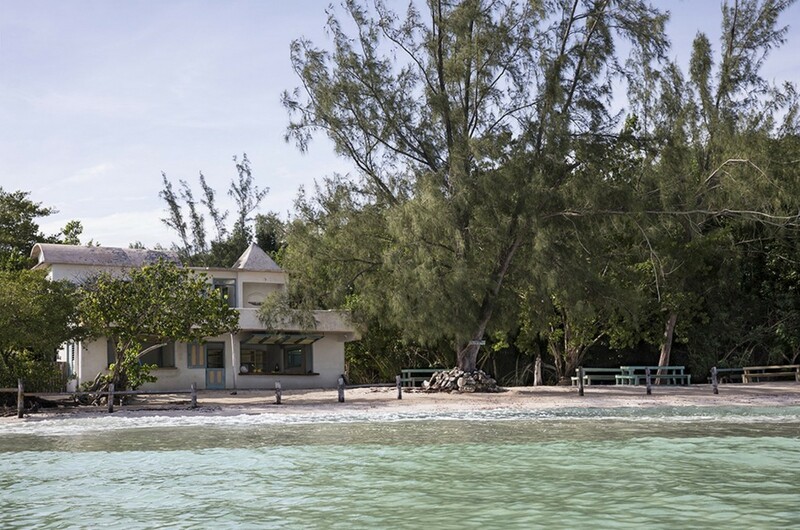 For activities there is Chukka with Kayak, Zip-lining, Quad and Rum-tasting just 5min walks away. Can only recommend! !